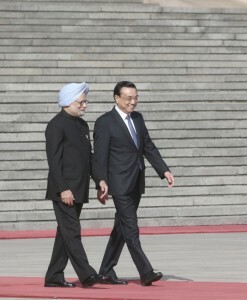 Chinese Premier Li Keqiang held talks with visiting Indian Prime Minister Manmohan Singh on Wednesday morning. The two sides signed nine agreements, including a crucial Border Defence Cooperation agreement, during talks in the Great Hall of the People in Beijing. “The agreement on Border Defence we just signed will ensure peace and tranquility on our borders,” said Singh. “Firmly believing that the India-China Strategic and Cooperative Partnership for Peace and Prosperity serves the fundamental interests of the people of the two countries. Reiterating that neither side shall use its military capability against the other side and that their respective military strengths shall not be used to attack the other side…” reads an excerpt from the border agreement. This is the second time this year that the heads of government of the two countries have met following Li’s visit to India in May. It is the first time since 1954 that a Chinese premier and his Indian counterpart have met in each other’s country in the same year. “China and India’s relations are above all a relationship between 2.5 billion people of our countries,” said Singh. The two sides also signed an agreement on trans-border rivers to provide for expanded cooperation on shared rivers. China and India also signed a memorandum of understanding on roads and transport and one on power equipment that would enable establishment in India of Chinese power equipment service centres. Singh arrived in Beijing on Tuesday night for a three-day official visit to China. Chinese President Xi Jinping is scheduled to meet with the Indian prime minister later today. China’s top legislator Zhang Dejiang will also meet with Singh. The Indian prime minister will deliver a speech at the Party School of the Central Committee of the Communist Party of China. Singh has, in an interview to Chinese media, reiterated India’s “unsustainable trade imbalance” with China and has asked for more FDI from China as well as greater access to Chinese markets for Indian goods. “We are happy that more Chinese firms are looking to India as an investment destination. During his visit to India in May 2013, Premier Li Keqiang suggested that we look at the option of establishing a Chinese Industrial Park in India where companies and firms from China could cluster together. We welcome this idea, ” he said. He noted that recently a Chinese delegation visited India and had good discussions with concerned officials. “We have also shown them a few possible sites for a Chinese Industrial Park. We will work with the Chinese side in implementing the idea,” said the prime minister. Singh also said India would “participate with great enthusiasm” in talks for the China-proposed BCIM Economic Corridor. “We believe that the BCIM Economic Corridor can potentially reinforce our existing connectivity initiatives and we have expressed our support in principle to the idea during Premier Li Keqiang’s visit to India,” he said. India has already set up an Indian unit for the Joint study group that would look into the feasibility of the Bangladesh-China-India-Myanmar corridor, its alignment, funding, responsibility of member countries, economic potential as well as soft infrastructure requirement. “Following our agreement during Premier Li’s visit to set up a Joint Study Group (JSG) of all four countries, we have set up the Indian component of this JSG. India will participate with great enthusiasm in its deliberations,” he said.